It is time to share what I have been working on in the Sew We Quilt Dresden Blog Hop! Whiel rumaging through my rulers I found some Laundry Basket Dresden Templates that inspired the star inserts - I highly recommend them. They were such fun to play with and I liked the crisp white triangles against the soft prints. The backgrounds are Patrick Lose prints. I saved the emerald green Bella print for the border for higher contrast. Visit all the other blogger's sites to see the pretty Dresdens they have posted! There is such a wide variety! Leave me one comment before Thursday the 31st at midnight on this post for the chance to win some Bella fat quarters. Your Dresden runner is fantastic! The colors are so cool and calming. Thank you for sharing. I always love your creations! Those white inserts certainly add interest. Thanks for more inspiraiton. Beautiful, your fabrics are so pretty - I like the addition of the little triangles very much. Beautiful! I love the colors you used. Thanks for sharing. That is a lovely variation on the dresden with the extra white points - pretty fabrics too! Its lovely - beautiful colours. Thanks for sharing. Your table runner is gorgeous. I just love the fabrics you have used. Lovely project and lots of very nice stitching... I love it when it looks just right as yours! thanks for sharing and the chance to win! I love your choice of colors. I really like your new fabric line, as well as this project. Thanks! I really like it with the inserts, very pretty! Lovely table runner. Thanks for sharing & the chance to win. Beautiful runner! The colors are so springlike and refreshing! THanks so much! Wow, that's beautiful! The little fussy cut flower squares are a great addition to the lovely blocks. I like your oversized centers of your Dresdens! Beautiful fabrics. 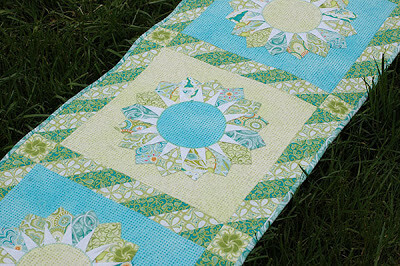 Lovely Dresden runner and your quilting is great too. I was admiring your FMQ on this. I just last night tried it for the first time. I was thrilled to find the right setting for my tension.. YAY!! Step one complete :) I am on my way.. LOL. Okay I have a long way to go to make my hands do what my mind wants them to do and make mine look as beautiful as what I just saw your picture show.. ho hum..it is a shame to waste beautiful fabric in the effort. Really, really nice table runner. Love the quilting also. Beautiful runner in such soft feminine colors ,I love it . Thanks for sharing . Love the details! I don't normally like the emerald green color but yours looks nice, I may have to reconsider. Thanks for a look at a truly lovely table runner. The colours and fabrics are gorgeous. The little white points are perfect! What a lovely runner! I love he colors and the star pattern. This is simply gorgeous- have never seen anything like it before! This is awe inspiring! Like the dresdens will have to check out those templates. Your project is just gorgeous, as are your fabrics! I would love to win some Bella fat quarters to go with the pieces I already have!! I've been having so much fun with them! Amanda, it is a gorgeous runner. I have not ever seen the dresdens made that way. Really neat. Fabulous runner Amanda and the colours are gorgeous! What a gorgeous runner!! I first nticed the design and the beutiful colors, but a close-up look at those great fabrics... swoon!!!! Thanks for the chance to win some FQs!!!! Love the tablerunner, such beautiful colors. Thanks for sharing. 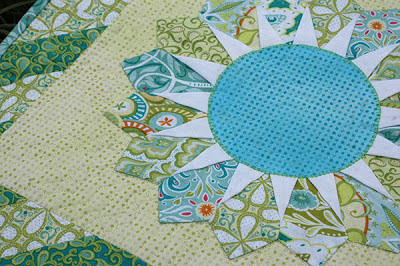 I love the white stars and especially the quilting! 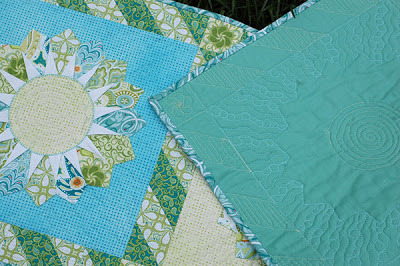 Beautiful design...and loved the photo of the quilting! 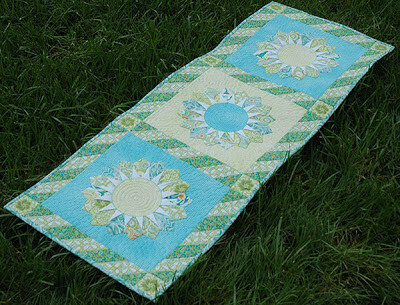 I love your table runner... the fabric is gorgeous and the quilting perfect!! Thanks for sharing in the hop!! What a beautiful runner! Thanks for sharing. great table runner! love the colors and the white just makes it all pop. Thank you for sharing. Those colors are so serene, and so happy together! I really love the colors you chose for your project. So soft and pretty. I need those templates! I want to make some dresdens like yours! Lovely! Your fabric choices are wonderful! Thanks for sharing! What a cute table runner. I love the sort of light beachy color. Thanks for sharing your awesome talents with me. 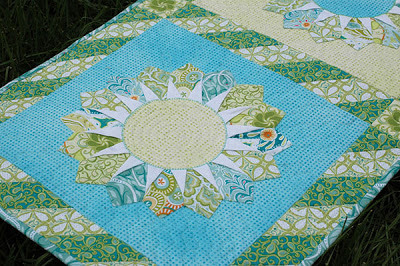 That is gorgeous and your quilting looks wonderful. The colors are so beautiful. Another dresden star in the sky-stunning! From CA, thanks for sharing. Lovely! The white really makes the other colors pop. Good job! Love the colors and great stitching too. Oh my what a gorgeous project. I love those fabrics...Absolutely beautiful and calming colors for sure.. Your blog is new to me. I have signed up to follow you. Love the colors in your quilt. Beautiful -- love those colors! Very pretty. I love your color choices...so fresh looking! Thanks for sharing and thanks for the giveaway! Wow those white star insets look 3D. How cool is that! Nice runner, so soft and pretty looking. what a cute little runner! love the colors! lovin your color choices and I am a new follower! Love it!!! Summery colors are Awesome!! I love your Dresdens. thanks! Those Dresdens are beautiful and creative. Your dresdens are so pretty and such gorgeous colors. Beautiful! I love the colors.Thank you for sharing and for the giveaway. I am loving your table runner! Your fabric choices were wonderful! Just beautiful! This project is just wonderful. Of course I absolutely love the fabrics that you used. The runner is beautiful and I love the fabric choice! Such beautiful quilting! Love it! The white triangle inserts make the Dresden pop. I love the fabrics and the white triangles draw the eye to just the little pop of red (or orange) in the fabrics. A great job! The quilting is beautiful and looks great on the solid emerald green backing. The binding looks great with each side. Thank you for participating and the wonderful inspiration. Such beautifully inspiring colors! Awesome work. Love the white triangles - great effect. This is a lovely, understated piece - very elegant. Just gorgeous Amanda, as always. I really LOVE this one and those fabrics are so pretty too. Is the Laundry Basket Dresden template different somehow? I attempted to find it, but it doesn't appear to be on her site. I have another one but wondered if there was a difference in using hers instead. Thank you. Really really pretty. I love the green and blue. Tried to comment this morning but blogger wasn't cooperating. I love your Dresdens. The color is so soothing and the fabric choice is awesome. Love it! Your dresden runner is absolutely wonderful.Thanks for sharing! Love the colors. I can see why Edyta's Star Dresdens are so popular. That white sets off the dresden nicely. Such a peaceful runner; so cool and refreshing. Wonderful design with the white inserts. I love your color choices on your runner. So pretty! Love how you alternated the background colors. Makes each block look so different! I like your Dresden runner. Very pretty. Love those colors and patterns. May I also say how much I love your quilting style? Echoing the pattern always looks so nice. It is amazing how those star points have been popping up on the dresdens. I absolutely love the look. Great table topper; thanks, Amanda. I love your dresden runner! The colors and details you did are wonderful! So pretty! The sea glass colors are so gorgeous, reminds me of the sea. Now this laundry basket dresden template is new to me, sure would like one. Beautiful table runner glad you shared it. I like the addition of the star points to the dresden. it really fancies it up! Your did a nice job with your quilting too! 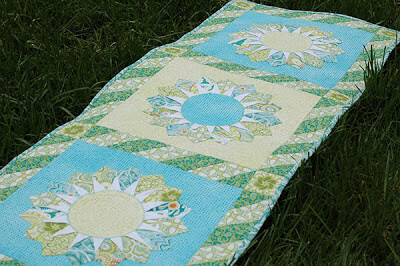 The Dresden you did is so pretty - I love it in the table runner style - and your stitching is perfect! Did you FMQ that?? I'm most definitely bookmarking this for future reference! Oh that is just so beautiful. soft, fresh and such pretty colors. Thanks for sharing. I love that color combination and the Dresden Star is beautiful! Thanks for participating and inspiring us! I love your tablerunner! Thanks for the giveaway. I love the dresden stars. I had not seen them before this hop, but I can't wait to give them a try. Thanks for sharing. Love your colors on your Dresdens! Your border is fabulous!!! 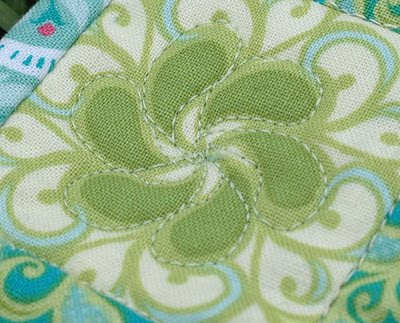 Great quilting - thanks for showing close-ups of it!!! WoW! Your runner is gorgeous! I love the triangles with the dresden, I have not seen that design before. Thanks for sharing with us, just awesome! I love this take on a Dresden, where can I find this pattern? Love your fabric choices too! What a neat project to make for the Hop. I love the white points which really make the blades stand out. Interesting colors very soothing! I really like the white additions. your tablerunner is stunning, thanks for sharing. Oh wow! Everything is just gorgeous. Fresh, young and fun! Beautiful. I love the soft colours. The sashing prints make it look even more intricate. I have not seen the little white inserts before this blog hop. They really do show off the colours. I love your tablerunner. Your quilting is beautiful! Great colors, and I kind of like that big ole round center! Beautiful! I love those sweet and lovely Dresdens. I have yet to attempt them as they intimidate me a bit. Thanks or the chance. What beautiful colors! The table runner is awesome! Pretty tablerunner. Thanks for sharing. I love how your quilting accentuated the fabric designs! Awesome! And your version of the Dresden is one of my favorites with the added inserts that make it look like a starburst. So pretty! The Bernina 780 - Paintwork Leaves!